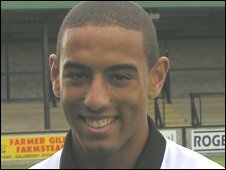 Southend United have signed Salisbury City winger Liam Feeney on loan until 3 January, with striker Charles Ademeno going in the opposite direction. Feeney, 21, has scored two goals in 18 Blue Square Premier games this season. The former Hayes & Yeading man looked set to join Dagenham and Redbridge last week, but the deal fell through. Ademeno, 19, who had a loan spell with Rushden & Diamonds last term, has only started one League One game for the Blues this season. Feeney was made available for transfer by Salisbury as they look to get their big wage earners off their books. Blues boss Steve Tilson told the club website: "Liam can play on the left or right and it's a chance for us to see him before the transfer window opens. "His pace is his main asset but he's a stocky lad and has great strength too." Earlier on Wednesday, Tilson told BBC Essex: "There's one I'm after but at the moment they won't let him out, so we'll have to wait and see what happens. "Otherwise, we've got people coming back - and once they're all fit and healthy we're not a bad side."